One of the good things about being a fitness trainer is that you get to sample some of the newly created trends with the promise to help one lose weight and stay in shape. 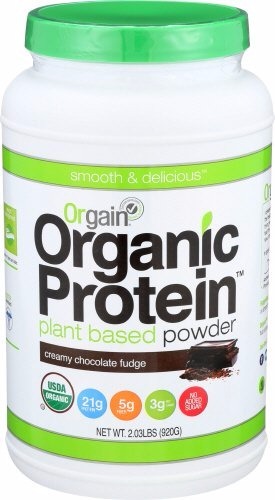 I will be the first to admit that I have missed quite a few products that I thought will not catch on with the buying public, like the Orgain plant-based protein powder. What got my attention is how my client used it to lose over fifty pounds in less than six months. When he first came to me it was difficult to keep him focused towards his weight loss goals. While I believe that old-fashioned hard work is what will get you the most weight loss, there is no denying the role played by protein powders like the one from Orgain. What my client did was to replace his need for snacks with this protein powder. As he lost all that extra pounds, my curiosity made me look into the merits of the product. Is the Orgain organic protein plant-based powder the ultimate magic wand that would make you lose weight overnight? Probably not, because my client also put in the required gym time by using treadmills and weight machines to transform his physique within a short period of time. The brand creator is Dr. Andrew Abraham, and his fight to survive cancer gave him the motivation to come up with a better product that contained no toxic ingredients. His cancer treatment came with the requirement that he stick to a mostly liquid nutrition. This brand was started in 2008, and it is remarkable how it has grown to be sold in almost all health food stores in the United States of America. It is one of the main organic protein powders you can buy on Amazon.com and has excellent feedback from current users. Apart from the Orgain protein powder, you’ll also find protein bars and nutritional meal shakes from the same company. From my research about this brand, their line of health and fitness related products are beloved by growing legions of consumers. To help tackle the question if this is the best protein powder one can buy online, the relevant information will be presented from the creator’s point of view, and from the opinions of current users of the Orgain vegan protein powder. At the end of this article, I will give you my personal opinion and where you can get it for less. Before we get too far ahead, let’s examine what the company published about this product. When you look at most Orgain reviews, there is no denying the fact that this brand has a few things going for it, because so many people are happy with its performance. The manufacturer claims this protein powder is formulated using mostly plant based ingredients and contains no genetically modified organisms. It is also free of soy and gluten ingredients. The Orgain protein powder is certified organic, and free of artificial sweeteners, artificial colors, or preservatives. It is further stated that this product is uniquely formulated to dissolve quickly when used in your smoothie, and can even be used effectively with just water. It contains no sugar but will provide your body ample supply of protein and fiber, which means you’ll have the additional energy needed to complete your fitness workout routines. There are four different flavors including creamy chocolate fudge, natural unsweetened, sweet vanilla bean, and vanilla bean and chocolate. There are five sizes to choose from, but keep in mind some of the flavors will not be available in all sizes. The list of Orgain protein powder ingredients will surprise you. Some of the most active ingredients include chia seeds, hemp protein, sunflower oil, brown rice protein, cocoa, sea salt, and many others. You can read the full ingredients list from the manufacturer’s website or the site with one of the lowest prices for this item. I will have more to say about the list of ingredients when presenting my own personal opinion about the merits of the protein powder from Orgain. Based on the information presented by the manufacturer, is Orgain organic protein powder for weight loss possible? I have to give you a qualified yes on that one, but read my personal views towards the end of this post. With online commerce now part of our shopping habit, it is crucial you take the time to read about current user testimonials before investing your money in any protein powder brand, regardless of the promotional hype from the creator or even celebrity endorsements. Despite all the glowing things said about this plant-based protein powder by the creator Dr. Andrew Abraham, you should give more credence to the feedbacks from current users of the supplement. One of the biggest take away from the feedbacks is about the taste of the powder. Since it does not contain sugar, vegans might find the taste more natural and pleasing. Few of the feedbacks called this product one of the greatest protein powders that come with a natural taste to it. Another take away from reading some of the feedbacks is the versatility of this protein powder from Orgain. The many ways you can use this product is only limited by your imagination. If you’re used to the taste of refined sugar, you might not like the before or after taste of this protein powder made by Orgain. Few customers called the taste horrible, which means they lacked the imagination to add the Orgain protein powder to fruit smoothies to make the taste sweeter. Some called the taste nutritious, but certainly not delicious. For those of you familiar with the Amazon rating system, the numbers go from one to five, with the higher numbers being the most positive. 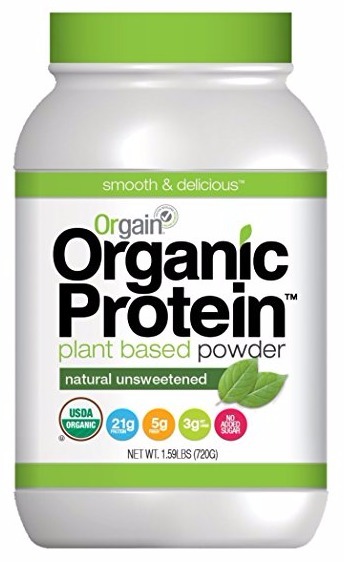 Well, an astounding 64% of the feedbacks for the Orgain vegan protein powder came in at full 5-stars, with 16% at 4-stars, 8% at 3-stars, 5% at 2-stars, and just 7% at 1-star. When you average the rating numbers out, this protein powder scored over 4.5 stars from all the feedbacks combined, which is fantastic, and remarkable for a brand that is less than ten years old. I have no doubt this product can help you lose a few pounds with the right fitness training routines but do not let the word organic confuse you. Have you noticed how the word organic is now slapped on every product you can find in your health food store? In my opinion, any health product that goes through industrial processing should never be called organic. This is not a knock against what this protein powder can do for your weight loss goals, but the use of organic Stevia as the main sweetener is not without a few detractors. It is true that natural Stevia like the one used in this protein powder is safe for consumption, but there are different opinions about this ingredient and you can read about it from the following four references. I will be lying if I told you this supplement alone can make you lose weight. It will only work for you when combined with a sensible dieting and exercising program. The worst thing you can do is just put this in your smoothie without doing any of the required exercising routines. From what I know about the cause of weight gain and the most effective ways to lose it, this protein powder should be used as an aid, since it will provide you with extra energy, which you can use to do more workout reps to build a better physique. The Orgain organic protein powder is free of preservative and colorings and can be used to increase your energy levels, which when used the right way will lead to faster weight loss. While you can find this product for sale at many health food stores, the online portal with the most amazing shopping experience with competitive pricing can be found – HERE!